Sixteen Good Things The Lib Dems Have Achieved | Sci-Ence! Justice Leak! With the Welfare Reform Bill being debated in Parliament at the moment, a lot of good Liberals are once again worrying about to what extent they can carry on supporting the party. Some of the provisions in the bill are excellent (the universal credit, for example, is a policy the Lib Dems and before them the Liberal Party had for decades, but we dropped it for being too left-wing and radical), others are debatable (a cap on total benefits equal to the median income of the country – there are genuine arguments on both sides here) and a few are frankly horrible (cutting contributions-based ESA for some claimants after a year). 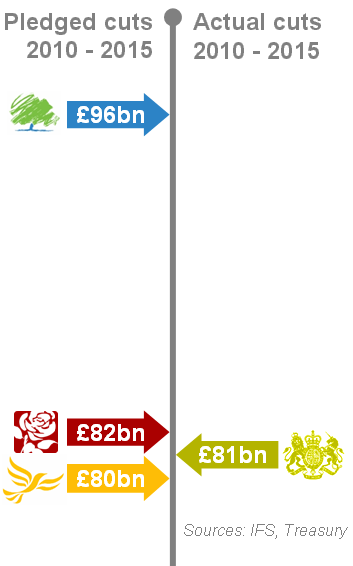 And that graphic is taken from a post written before the government announced it was slowing down the rate of cuts. In other words, a Labour government or Labour/Lib Dem coalition would have done substantially the same things, and a Tory government would have cut much more. This is actually as moderate a government as it was possible for us to get in 2010. Those sorts of things are, of course, real achievements, but they don’t really feel like it, do they? Thanks to us, some bad things some other people were going to do are now less bad, but still bad – that’s not a rallying cry to stir the blood. But in fact, we have also done a lot of genuinely good stuff, things that make the world a genuinely better place, that wouldn’t have been done by any other government. I’m going to make a short list here, but it’s not an exhaustive one – it’s just a list of things that I or my friends have noticed. My main areas of concern are human rights and constitutional reform, while most of the people I’m close to in the party are particularly active in LGBT+ Lib Dems, so those are the areas I’ll highlight. But I’m sure if you talk to people interested in, say, transport or energy policy you’d get a similar list. No longer deporting LGB people to countries where they’re at risk. Under the last government, the policy was “they can stay in the closet”. £400 million extra for mental health services, targeted especially at talking therapies Having worked in mental health under the previous government, one that supposedly cared more about the NHS than this one does (their supporters say) I can say from my own experience that the Labour party deserve never, ever to be allowed near government again simply because of their appaling, criminal, *EVIL* treatment of people with mental health problems. Mental health services are already improving under this government (I’m having to access services myself at the moment, for work-related stress problems, and the difference is extraordinary). This is something that was a personal campaign by Nick Clegg. Lords reform The first elections for the House of Lords are planned for 2015. We might soon actually be a proper democracy. An end to child detention of immigrants Private Eye argue with the letter of this, but the fact remains, under Labour literally thousands of children were held for weeks or months in what amounted to concentration camps (primarily at Yarl’s Wood) prior to deportation (or not – half were later found to be legal immigrants). Last year, numbers in the low double figures were held for single-figure hours immediately prior to deportation. I don’t care if Private Eye thinks that counts as ‘child detention’ in a literal sense – in a qualitative sense there is a huge, enormous difference. An enquiry into the UK’s part in torture in the ‘war on terror’. I’ve seen photos of people literally boiled to death by torturers in the Middle East, supposedly acting with the collusion of the British government. These people need to be brought to justice. The highest ever rise in pensions and unemployment benefits. Pensions are now on a ‘triple lock’, which means they will rise with whatever is greatest – inflation, wages or cost of living. Unemployment benefit rose by the same amount this year. Lowering taxes for the poor and raising taxes for the rich – Capital Gains Tax has increased by 10%, there’s been a levy on the banks, we’ve kept the 50% top rate of tax, there’s talk of introducing a mansion tax – and this is being used to raise the personal allowance for income tax so the poorest workers won’t have to pay anything. Detention without charge has been dropped from 28 days to 14. Still too long of course, but we’re some way back towards being a civilised country again. We have fixed-term parliaments – no longer will elections be at Prime Ministerial whim – this has been a demand of reformers since the Chartists. The government will guarantee most of the mortgage for first-time buyers – allowing those of us who’ve spent our entire adult lives paying rents to profiteering landlords because of the artificially-inflated property ‘boom’ to finally have the possibility of owning our own home, ending a particularly nasty piece of generational injustice. The government are also building more social housing than has been built in decades for those who still wouldn’t be able to buy their own home, so they don’t have to rent from slum landlords. No replacement for Trident will be bought this parliament – because if you’re going to cut spending, take the money away from nuclear weapons first. So this is why, despite the fact that I don’t support the government, I *do* support the Lib Dems in the government, and why I give up several hours of my weekends to go knocking on doors and delivering leaflets. Because we haven’t made the world perfect in only eighteen months with only nine percent of the MPs in parliament – but we’ve made it better. And that’s more than I can say about the actions of any other government party of my lifetime. This entry was posted in politics and tagged coalition, lib demmery, lib dems, liberal democrats, politics. Bookmark the permalink. And even some of the things you find horrible are debatable. I need more time to look at the primary sources to double-check, but if contributory ESA is being cut after a year, I don’t have much of a problem with that – some people were claiming that all ESA was being cut after a year, which would obviously be a huge problem. It’s very specifically only contributions-based ESA and only for those in the work-related activity group, so the sickest and poorest remain protected. Income-based ESA and ESA for those whose condition is not expected to improve will not be cut off. This is why I consider it a matter for grumbling about, rather than one for screaming from the rooftops about man’s inhumanity to man. I think the problem there is that income-related ESA is something you’re ineligible for if you live with a partner who works more than 24 hours a week. I don’t think that kind of part-time work on minimum wage is anything like enough to support two people, but that’s a wider problem and not specific to this debate. It is a problem though, in that income related ESA is stringently means tested in terms of both savings and spouse’s income. It threatens to put quite a few people into poverty. Rob: You’re not the first person I’ve heard say that the saving threshold is a stringent one. However, I’ve not (yet) seen anyone really explain why £16,000 of savings makes for a stringent threshold. That sounds a pretty decent threshold to me, although the figures I’ve seen for average savings per person vary massively depending on the definition. So would you mind explaining why you think £16k is a “stringent” threshold? The deposit on my flat was just over £17k. I went from above the threshold to almost no savings overnight, and it’s close to as little as you can pay for a deposit. I think “enough for a deposit on a cheap flat” would be a reasonable amount to let people hang on to, especially as equity doesn’t count as savings for this purpose. Mark, £16000 disappears quickly when you’re disabled. This is one person’s story that gives you a hint of what can happen: http://innervoice2011.wordpress.com/2012/02/06/what-26k/ Many people just haven’t twigged that being disabled can make everything more expensive, so putting disabled people on a par with able bodied people in monetary terms actually makes them poorer; they pay more for the necessities. Also it’s not just about the savings limit. You don’t get income related ESA if you have a partner who works more than 24 hours a week, regardless of their income. That’s a couple penalty if ever there was one. Thanks Rob. Will take a read. “The Government” are in no position to guarantee first-time buyers’ mortgages. The money used will be that they have taken from people who have struggled to manage a mortgage on their own without artificial help. The intention may be honorable, but the only fair way to do this is to set up a well publicised charity to which people (ie tax-payers) can donate, with the knowledge that these funds will be used to guarantee first-time buyers’ mortgage payments. That way, we would have a true picture of the support for such a move. Anything less is dishonest, as clearly is this “policy.” If someone can afford a mortgage and someone can’t, surely they shouldn’t both be purchasing the same house? A proper insurance policy, (and yes, I know most of these to date have been a con), would alleviate short-term problems such as unemployment, but to encourage those who can’t afford to join those already in debt on the housing ladder is just irresponsible. Would this be from the same Libertarian school of thought that says the only fair way to charge people for a fire brigade is if their house is on fire? On our planet, the government raises funds through a process we call taxation and spends it – redistributes it – on what they think people need. If they judge those needs wrongly, or demand too much tax, then they get voted out. That’s how people express their support or otherwise, not by individual voluntary donation. In this case the identified need would be housing. The government wants everyone to have a house. The government cannot afford to buy everyone a house. So they leverage what they can afford by having the people borrow to buy the houses with a guarantee for the banks from the government. All the people in the scheme get a house, Some of them default (ask your actuary). Government picks up much smaller tab. The guy whose house is on fire is the guy who’s likely to help the poorer guy with no house out financially, by paying his taxes to help provide a fire brigade to protect the poorer’s guy’s admittedly rented accommodation. The guy with no house to catch fire in the first place is the guy who’ll whinge about paying taxes to help put out the other guy’s house fire… I think you’re getting human nature exactly back to front with that fire analogy! There’s a big difference between having somewhere to live and being given a house without earning it. This is the ‘libertarian’ right fallacy in a nutshell. When anything doesn’t suit the haves it becomes ‘artificial.’ The housing market is a human construct, it’s not a forest or a river! If we don’t like the way it’s working, we should look at changing it. Two principle drivers of the spike in property prices were the refusal to build more public housing and the erosion of tenant’s rights, in particular rent controls. Simultaneously they made renting a worse option, and made property ownership much more lucrative. The government made these changes after lobbying from large property owners who stood most to gain, it’s merely favouring one social group (the well off) against another (the not well off). One is as ‘artificial’ as the other. The person who’s “struggled to manage a mortgage on their own” should start asking themselves how come it was so hard. The Fire Brigade is partly paid for out of Council Tax, which tenants have to pay. It would obviously be best for all British citizens to own a house. There is no shortage of housing as such, just a surplus of people beyond the natural level for this country, as would be expected from the past sixty years at normal birth rates without mass immigration. Not libertarian, just plain old fashioned right, as in correct, factual or common sense, just to make that clear. One should be able to make a valid point, in agreement or otherwise, without having insults or “libertarian right” labels bandied around. Surely it is always best to win an argument by presentation of facts rather than resorting to insults if possible? I thought that’s what the Lib Dems stood for, rather than the old left-right abuse? Or have you just joined the others nowadays? Incidentally, no market is a “human construct.” Many have tried and failed. I’m sure you remember what she said! Yes, and that’s what I did! (Unless you’re persisting in claiming there’s no Council Tax contribution to the Fire Brigade.) Your response basically boils down to complaining no-one’s agreeing with you. Oh, and explaining there’s not too few houses, there’s too many people, which frankly sounds self-parodic to my ears! You may not like the term ‘libertarian right’ but if you use their arguments, then I’m afraid you’re going to get labelled as such. Incidentally, I’m not a Lib Dem. I’m here because I’m a Kinks fan. And if markets aren’t human constructs how did they get here? First, Gavin B is not a Lib Dem – he’s some form of anarcho-syndicalist socialist something-or-other. I am an unabashed partisan, but this blog is read and commented on by people of all political persuasions – among my regular commenters are at least a couple of SNP supporters, two members of Labour, a couple of Greens and a Tory – although there are more Lib Dems than you’d get in a statistically random sampling. Please don’t make assumptions about other people’s politics unless they state them. Secondly, you mention ‘mass immigration’. This is a huge warning flag for me. There are definitely political discussions to be had – sensible ones – about immigration (I am libertarian enough to want total free movement of people, but am also small-c conservative enough to believe that the government needs to make far more effort to allow and encourage assimilation by immigrants. I do not have time to discuss my reasons for these positions in any real detail, but rest assured I *have* reasons for them). However, I’ve noticed that the vast majority of people who bring up ‘mass immigration’, especially in completely unrelated contexts, tend to do so for reasons that are very far from legitimate. You have not yet said anything which should make me stop giving you the benefit of the doubt, but be aware that my wife is an immigrant and I have no problem with banning people who might make this comments section an unpleasant place for my wife to visit. Andrew, My wife works for a company employing, almost literally, one employee from every other country in the world. They are all professionals, and employed here because of their abilities. It is a supremely successful operation. The employees in question mostly rent because they will move on internationally in due course. My point was that when people complain about a shortage of housing caused by lack of building and/or investment, they often refuse to accept the obvious link between the number of houses needed in the long term, and the massive numbers of probably temporary economic migrants who have arrived here over the past few years in particular. This has resulted in massive demands on the rental stock, which has then led to a shortage of properties for sale, due to many home owners deciding to rent out their houses for profit, often splitting their (previously) family home into rooms for Homes of Multiple Occupancy. This usually results in a degradation of the condition of the property, as landlords try to squeeze every penny of profit from their investment. If many current economic migrants return home in the next few years due to lack of employment opportunities here, we surely don’t want massive new housing estates lying empty, blighting the countryside and becoming hellholes of vandalism, as can clearly be seen all over both Northern and Southern Ireland, where speculative building was encouraged, and there is clearly less of a “housing shortage.” Yes, house prices have collapsed there in a very big way, due mainly to over-supply, but if you have friends or relatives over there, you will know the despair is far greater than it is in the rest of the UK. Incidentally, I do not support any of the current parties on offer, (and yes, I do mean ANY! ), and have resorted to deliberately defacing my ballot papers as a “None of the Above” protest in recent years. This proves, I hope, that I am not merely apathetic when it comes to politics. And the reason I got here was from following an album review you wrote some time ago for the Four Seasons “Imitation Life Gazette,” which led to a mention of Frank Sinatra’s “Watertown,” for which I thank you. I’d never have heard of it otherwise! Thanks for the clarification. That makes sense, though I disagree for reasons too complex to go into in a short comment, and I apologise for any implication that you had bad motives for bringing the subject up. I hope you can see why I had to ask though. I am also continually amazed by the way migration is seen as a one way street. Like, there’s such a thing as emmigration too! As a point of pedantry, if I had to be pinned to a label I’d say I was a libertarian communist. That’s partly what vexes me about the ‘libertarian’ right, that they have the chutzpah to think they can use that word. If Andy Bolton is saying that’s not his persuasion then fair enough of course. But it seems worrisome that people are using those absurd, arbitrary and self-contradictory arguments without even thinking of them as political points. Wow, bananas. The renter whinges about paying taxes to put out the homeowner’s fire? That’s nowhere near human nature, it’s not a real-world example and it doesn’t hold up. The renter doesn’t want only buildings with renters in them to be saved from fire, for goodness’ sake! And if he did, it’d be damned incoherent of him considering that the building he lives in is also, inevitably, owned by someone. Not that it’s less incoherent on the part of the hypothetical homeowner, to think he’s doing the renter a favour by paying tax to the fireman…has he no feeling for his fellow mortgage-payer, the renter’s landlord? Is it all just some sort of noblesse oblige, in his mind? It almost seems as though, in this homeowner’s mind, “renters” are pretty indistinguishable from “squatters”…and the landlord who makes his living from collecting rent, and then uses it to pay his own taxes, has become an un-person. It puts me in mind of a poor neighbourhood I used to live in, where a classmate’s father owned and operated a grocery store. A hardworking fellow, he provided for his family, sent his daughter to university, owned his own home…paid his taxes. Yet 90% of what came in through his door was dole money: in a way, his business was entirely subsidized by the government. That it’d be impossible to pretend any longer that we’re not all in this together. I’ve never met any renter who begrudged a homeowner his fire protection. I never expect to. It’s just not common sense, to think there are such people: if there were, I woulda met them. And as it happens, there is a big difference between having somewhere to live and being given a house without earning it, in that to be given something without earning it, that’s just a fancy moralistic way of saying “to be given something”, right? To not have paid for something. Because in a world where money’s just money and the money’s not marked, “earning” is just “paying”, anyway? Or are we going to take away the lottery-winner’s dream home because their money’s extra-indolent, or something. Obviously we are not; obviously that doesn’t matter to us. And obviously there’s a big difference between having a place to live and receiving a gift of a place to live, in that possessing something and receiving a gift of something are completely different categories of things…you might as well say there’s a big difference between being well-fed and having someone cook you a spaghetti dinner. It’s basically a non sequitur: there’s a big difference because there’s no real relation. So the only question is, does this scheme mean that people who can suddenly hope to own homes, who could never hope for that before, will be being given them? The government will simply buy them a house? They won’t pay for these houses? Then I guess you can say they will not have earned them, since earning = paying. Mind you, as far as I’m concerned, since everybody needs a place to live I wouldn’t care if they all were given houses without having to pay for them anyway. I’d be totally okay with that, because I’ve met rich people and poor people, and good people and bad people, and I’ve noticed those polarities don’t map onto one another in any reliable way. So why not give everyone a house? At least it’ll keep them out of the rain, you know? Sorry, long comment, and maybe I sound a bit angrier than I wanted to. But I figure I’ve been poor, so I get to talk? Hell, I’ve never even had a credit card, because I’ve never made enough money to have money to spare for deferred purchases Owning a house? As an adult, I feel about that the same way that as a child I felt about having a puppy: I would love it and take care of it, but we just don’t have the room and what if it gets sick and needs a doctor. But for hardworking people who are actually reliable and upstanding…if the only barrier is that a bank won’t lend to them, but through some government guarantee the banks then might…then hell yeah, let’s get these people in houses. You know what Jimmy Carter said about Habitat For Humanity? It’s exactly what Archimedes said about leverage, the old “give me a place to stand” thing…put house keys in someone’s hand, and in five years they have savings, in ten years their child has become the first member of their family ever to go to college. So what’s wrong with that? Please pardon my cri de coeur, Andrew. And delete as necessary. If I were you, I’d take some time to conduct long hard research into the nature of IDS’s “universal credit”. I’m sure you’ll find no enthusiasm for it whatsoever in practice. This isn’t anything like the admirable Grimond-era solution. The problem there is that LD MPs would have been whipped to vote for the Slaughtering Of The Firstborn Bill and most wouldn’t have the cojones to defy the whips. Indeed there would be some who actively support it :) Yes I *know* it’s a coalition and not a confidence-and-supply arrangement but we’re dealing with TORIES here. Devils, long spoons, etc. Doomed to fail, just like AV was. Wilson tried this in ’66 and got nowhere; the Tory backwoodsmen in the Lords saw to that it. It will be the same this time around even without the hereditaries; Cameron’s chums will see to that once they get appointed in ever increasing numbers. When? Heard nothing about this. Again, is it? All I’ve heard is that the time limit that the police keep unconvicted suspects’ DNA has been reduced. Double edged sword. Not only can Cameron cram the upper chamber with more of his cronies, but now it appears the Tories in the Commons – with the complicity of LD MPs, shame on them – can railroad whatever they like through the Lords if their “financial bill” plans for the WRB are anything to go by. And where might those be? Round here they’ve been hived off, not built. Worse, the big estates are becoming like WWC ghettoes. I’ll give them credit for getting rid of ID cards and the National Identity Register though; but then again, the Cameroonies AND most of the swivel-eyed tendency of the Tories were on board here too, like stopped clocks actually telling the right time. Basically, the Government has promised at least equal civil marriage, by 2015 at the latest, and the consultation will explore other aspects such as equal civil partnership, and religious marriage. Though in fairness the actual proposals on the table are pretty rubbish and don’t really deserve to succeed. It would be easier to fix the rubbish undemocratic system than to introduce a rubbish democratic system. I’m inclined to think the whole point of electing the Lords is to make the 50-odd Commons seats the LibDems get look anomalous. I think the LibDems have to fight a lot harder on the NHS to regain some of the good will they’ve lost. The Bill should tax commissioning from private companies in order to encourage co-operative organisations. The only point I’d disagree with is the help for First-Time Buyers. As a wannabe-FTB myself, I am really unimpressed by this. The intergenerational unfairness is created by high house prices (i.e. housing costs). Spending taxpayers’ money on help for FTBs just ensures that prices remain too high for the next generation. In the end what we need is more housing supply and a tax system that properly reflects housing consumption. This government is taking steps in the right direction with the NPPF proposals that will allow the market to meet housing demand better, but its council tax polices are more of a mixed bag. Yeah, I agree. Lending money to people to buy into overpriced housing is throwing good money after bad. The market needs to be allowed to deflate, over a period of a few years, until places are affordable. There are some definite positives on this list. But, like previous commenters, I’d be sceptical about some of them until things are finalised. I fully expect Lords reform to be torpedoed by the Conservatives, as they did with AV. And I agree with the comment that not all proposals for Universal Credit are equal. Anyway, the smart money is on the IDS version heading for logistical disaster. I would say, though, that I disagree on your housing points. In my view the Govt agreeing to underwrite high loan-to-value ratio mortgages was precisely the wrong direction to take. The only people it really helps are speculative builders who want to shift some unsold stock in the short run. The problem is that housing is still overvalued relative to average incomes. The solution is not to create a new prop to keep prices high, but to engineer a price reduction. The US housing market looks like it may now have bottomed out because prices have fallen sufficiently to restore affordability. UK is still overpriced. The government is not building more social housing than has been built for decades. Or rather it has redefined what is meant by “social housing” so that it entails rents at much higher (near market) levels. These are now termed properties at ‘affordable’ not ‘social’ rents. It is an interesting linguistic gyration to define ‘affordable’ as ‘more expensive’. This implies either more people claiming housing benefit or social housing being let to different people (those who can afford the higher rents). That doesn’t mean building affordable rent housing is a bad thing. It contributes to meeting housing requirements. But it shouldn’t be confused with social housing as we’ve conventionally understood it.